Bactrian camels can be seen in the Nubra Valley of Ladakh. This two-humped animal is originally from the steppes of central Asia. Read to know how these animals reach Ladakh from far-away Central Asia. India is a land of diversity. This diversity can be witnessed in the animal kingdom also. There are different types of animals found in India. In this article, we will discuss a very interesting animal seen in the Nubra valley of Ladakh. 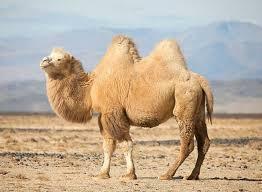 This interesting animal is Bactrian camel or double-humped camel (Camelus bactrianus). More interesting is the fact how these camels reached India from the steppes of Central Asia. Let us try to find out the details of the Bactrian camel in India. It is a large, even-toed ungulate native. The origin of this animal is the steppes of Central Asia. It has two humps on its back and this is the difference of this camel from its cousin found in the desert, single-humped dromedary camel. Bactrian camel is the largest mammal in its native range. The shoulder height of this camel is 200 centimetre to 230 centimetres; the head and body length is between 230 centimetres to 350 centimetres. The tail length of the Bactrian camel is around 50 centimetre. The weight of these camels can be from 500 Kilogram to 1000 Kilogram. The male camels are much larger and heavier than female camels. Bactrian camels can withstand very low temperature (-40 degree Celsius), has high disease resistance and very high feed conversion efficiency. It can propagate naturally, roaming and grazing in the range all year round without any supplementary feed. In earlier days, Bactrian camels were extensively used to carry heavy loads in caravans along the silk route because these animals can easily carry loads of 100 Kilogram and more and can walk for 8 hours at a stretch. Bactrian camels are now scattered in various parts of Asia. These camels are mostly found in China (around 2.7 lakh), Mongolia (around 2 lakh), Kazakhstan (around 2 lakh) and Russia (around 1 lakh). These camels are also found in Uzbekistan, Afghanistan, Pakistan. Turkmenistan, Turkey, Azerbaijan and in Nubra Valley of India. If we see the map of Asia, we will easily understand that the distribution of this animal is along the ancient Silk Route in Asia. In the 1980s, the number of Bactrian camels was dwindling very fast in India. During 1980-81, the number came down to only 12! However, thanks to lots of effort by the environmentalists and rising consciousness among local people, the number of Bactrian camels in India has now reached almost 250, out of which 30-35 are calves. Let us go back to the old days. Thousands and thousands of merchants used to travel by the Silk Route from the steppes of Central Asia to the Tibetan plateau through various passes. Along with the merchants, Bactrian camels used to move with heavy loads of fruits, spices, silk, valuable stones and various other items. There was no passport, no visa, The merchants and animals used to travel thousands and thousands of mile years after years, centuries after centuries. The Silk Route ultimately got closed in 1950. Haji Abdul Razzaq Jamsheed, a Ladakh-based historian, has done extensive research on Bactrian camels. He has written a book "The Tale of Nubra Valley." In this book, he has stated that the Bactrian camels first came to Ladakh permanently in the 1870s. These camels were brought from Yarkand in the Xinjiang province of China. Some Chinese traders sold the camels to the local people. Some camels remained because these had been unwell, and later became fit after adequate rest in the Nubra Valley. The Silk Route has been closed. People no longer travel from the steppes of Central Asia to China along with goods. With the availability of heavy trucks, the Bactrian camels are no longer used for carrying heavy loads. These camels are found in the picturesque villages of Hunder, Sumoor, Diskit and Tigger lying by the side of River Shyok in the Nubra Valley. The environmentalists have been able to teach the local people to protect these rare but unique animals. A Bactrian camel safari has been started at Hunder village under a registered co-operative society since 2009. This safari is giving an opportunity to the local people including the owners of the camels to earn a handsome amount from the safari. And the number of Bactrian camels has been increasing in India. The author has presented the valuable information regarding this strange camel which has reached India from central Asia. I appreciate the efforts of the author in bringing out the authentic details about this special camel so lucidly in this article. It is a very interesting information and it can be developed as a tourist attraction so that the place can also develop and have commercial activities associated with tourism. Another thing is it will protect this species from the poachers and they will eventually multiply and will be saved from extinction. Wherever we have not cared for these rare or exotic species they have perished and became extinct. Thanks to Mr. Umesh for reading this article. As I have already mentioned in the article, during the early parts of the eighties, the number of Bactrian camels in India came down to only 12. Fortunately, a wildlife NGO started telling people of Nubra Valley about the specialties of the Bactrian camel. Over the years, with the help of Village Administrative Body (VAB) headed by the Goba (Headman), the conservation effort of this camel has become highly successful. The number of this camel is now almost touching 250. At the same time, the villagers of Hunder, Sumoor, Diskit and Tigger are earning a good amount from camel safari. The adventure and nature-loving tourists are enjoying camel safari at Hunder encompassed by magnificently beautiful sand dunes and this camel safari is becoming more and more popular. This safari is also helping the conservation efforts of the Bactrian camel in India. A nice article was written by the author about the Bactrian camel. This camel is better than the normal one-humped camel because it can bear more load moreover because of its two humps it can survive better than it's cousin when there is a scarcity of food. This creature can even survive 40°C in summer too. It has big eyelashes which enable it to survive in deserts and don't let the dust enter its eyes. Its big toes are an adaption to walk comfortably on the hot sand of deserts. They have the ability to go without water for months at a time, but when water is available they may drink up to 57 litres at once. When well fed, the humps are erected, but as resources decline, the humps shrink and lean to the side.